So far, the tour is progressing nicely. Aside from cramped accommodations, lack of sleep, greasy food, and an occasional miscommunication with a club owner over the amount and timeliness of your pay (Fred makes sure that you don’t get stiffed), life on the road is a happy series of wacky misadventures. On a side trip to Mobile, Fred the sound man picks up an assortment of new mics, cables and effects units. “It’s all in the name of show business,” he swears, but you suspect he’s loading up on cool new toys for his personal amusement. At Friday night’s gig at Luke the Drifter’s Highway 84 Inn, between Opp and Dothan, Fred (without the benefit of a pre-show sound check) adds the new gear to the mix. As an astute judge of sound quality Fred is able to discern subtle problems that might, to less discriminating ears, go unnoticed. Early in the first set, he hears sonic irregularities in the front-of-house system. He leaps into action, but the problems are difficult to pinpoint. Fred knows that his PA gear is in good shape; still, the bass response sounds muddy. The highs lack the crispness he’s come to demand. In some areas of the room, the music seems to disappear into some sort of sonic fog. You get through the show, but the experience has been a sobering one. Fred is mostly silent on the overnight drive to the next stop. Early the next day, he makes a call to Galaxy Audio. “Cool. Now I know,” says Fred. Fred is frantically taking notes. Brock continues, “Major mic manufacturers have been known to build mics which are out of polarity. 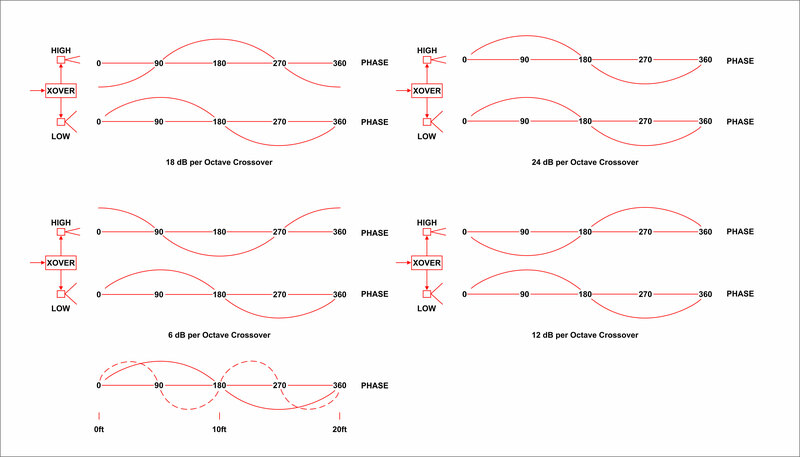 Many mixers invert polarity in their effects, auxiliary and monitor sections. Amplifier inputs are also notorious offenders. When combining amps from different manufacturers, or sometimes from the same manufacturer, you may encounter polarity problems. “There are infinitely varying states of phase (Figure 9: below). A 56 Hz tone has a wavelength of approximately 20 feet,” Brock says. “So if you’re standing 20 feet away from a speaker that’s producing a 56 Hz tone, the phase at your location (17.8 milliseconds [ms] from the source) is 360 (or 0) degrees. At 10 feet it would be 180 degrees,” Brock says. “And since phase is all over the map, I should concentrate on polarity, which I can control,” Fred notes. “You bet your tweeter,” Brock says. A quick check with the Cricket® and the next night’s show goes off without a hitch. You decide to make Fred a full partner.